One of the film-related concepts from this particular presentation, the Imperial Outpost playset appears to have been roughly based on both the shield generator in Return of the Jedi, and the Death Star's gun turrets in Star Wars. Judging from its size vis-a-vis the depicted AT-AT (I doubt the AT-AT was included with the set), this would have been a rather large and elaborate toy, comprised of several components and levels. 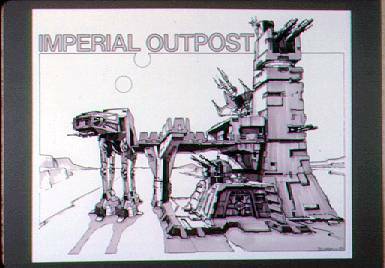 Much of the information regarding the Imperial Outpost playset concept, as well as the existence of other unproduced conceptual material, was first brought to light by collecting guru, Steve Sansweet, who covered these concepts and prototypes in issue #2 of Star Wars Galaxy Magazine.